Erick Ochieng: Now I’m Ready For The Big Fish - Rose or Cox Next? On Saturday night, at Alexandra Palace in London, English Light Middleweight Champion Erick ‘The Eagle’ Ochieng retained his title in style, with a fifth round stoppage over Southern Area champ Ryan Toms. In doing so the 25 year old from Stoke Newington, via Nairobi, Kenya, sent a solid statement of intent to British Champion Brian Rose and Commonwealth Champion Jamie Cox that he has them firmly in his sights. Even though he is without doubt a natural talent, Ochieng firmly puts his meteoric rise down to his manager and coach Bryan Lawrence and his unconventional approach, by today’s standard, of taking tough learning fights rather than protecting his charge with journeymen throughout the early stages of his career. Whilst it is true that during his early career Ochieng fought the odd journeyman, such as Matt Scriven (Erick’s debut fight) and Alex Spitko, as well as a couple of tough fighters with negative records, the vast amount of his fights have been against genuine prospects. In just his second bout Ochieng took on, and beat, Prince David Davis in his own back yard in Nottingham, then following a fantastic second round KO against seriously tough Jon Harrison faced, and beat, unbeaten previously unbeaten prospect Curtis Valentine. In his fifth bout Ochieng stopped the durable Alex Spitko, before going on to beat former yet another seriously tough opponent in Lee Noble. Ochieng then suffered his only loss of his career, a highly contentious points decision to rising prospect Luke Robinson, after which referee Ken Curtis was slated by the media for this rather dubious decision. Not being one to dwell on things, within weeks Bryan Lawrence accepted another testing challenge for his talented charge, one that could easily be described as an early career defining fight, against Liam Cameron, a seasoned, and previously undefeated in nine outings, prospect. What’s more again the bout would be in the opponents own back yard. With another big scalp under his belt, an eliminator for the British title was quickly lined up, but fell through just weeks before fight night. Instead Ochieng took a low key six rounder, against Dee Mitchell, at the York Hall in London in order to keep busy. 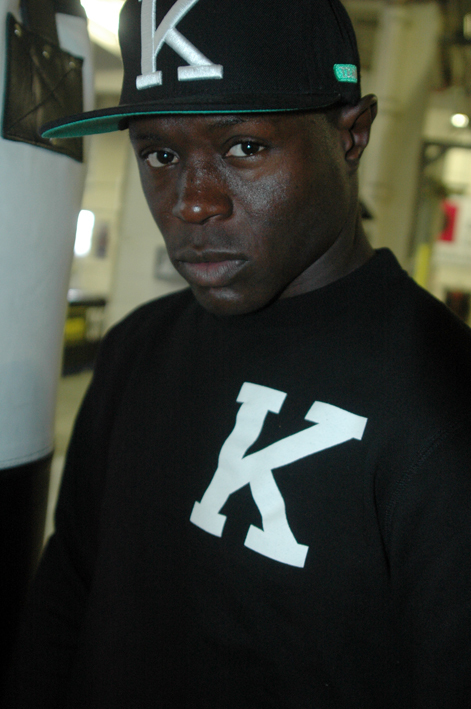 This proved to be a very good move, as a few days after his victory over Mitchell, Ochieng received news that he was to get a shot at the vacant English title, the bad news though it was to be against Liverpool’s Scott Quigley, who like Erick had just the one loss - which came at the hands of Robert Lloyd Taylor in the final of the excellent Matchroom Sport promoted Prizefighter Light Middleweight tournament. Over a thousand punches were thrown in the first eight rounds of the barnstorming, Fight of the Year nominated battle. The pair of Warriors stood toe to toe most of the fight throwing seemingly never ending salvos of massive uppercuts, heavy hooks and solid straights. After eight nonstop action filled rounds, Ochieng was five rounds up on the judges scorecards and Quigley already had the look of a beaten man, as was proved just seconds into the ninth, when Quigley’s corner threw in the towel to save their man any further punishment. Some four months later Ochieng and Lawrence were heading back up the M1 to Nottingham, where ‘The Eagle’ was set to face yet another midlander, AA Lowe, in his home town, this time though it was for the first defense of his English Crown and more importantly for Ochieng it would be in front of a massive Worldwide audience on the undercard of Carl Froch’s defense of his IBF World crown against Lucian Bute. ‘The Eagle’ put on a masterful display, boxing of the back foot and picking his punches, and boy did he pick them in style on his way to securing a virtual shut out points victory. Which brings us full circle to Saturday night and the magnificent stoppage win over Ryan Toms, leaving only the question of what now for the soaring Eagle? On returning to the TRAD TKO Gym earlier today, the effervescent Ochieng shared his view of the fight, as well as provided an insight into his future plans. ôFirst of all I want to give thanks to my Lord and Saviour Jesus Christ for the victory. It was awesome, you know, I knew Toms was going to be a tough opponent, which he was, he had a tough head for sure. Everyone that can punch is dangerous, he stopped Nathan Weisse in his last fight so I knew he had power in his left hand and I knew I had to stay away from his left, if you're fighting a southpaw you have to stay away from the left, which is what I was doing. In the first couple of rounds I kept making him miss and focused on him and what I am going to do. I was just trying to find my distance, you know just measuring him up, because he has that good defense. At the end of the fourth Bryan said you’ve got to walk him down and hold your ground more, so in the fifth that’s what I did, I held my ground and hit him on the body, when I did I see it in his face, he didn’t like the feel of them punches on his body, so then I thought ah these body punches are getting to him, so went at him again and threw a big left hook and he just went straight down. For the count I went to the corner and I came back and went right back at the body, because I knew the body shots were hurting him, I see the opportunity and grabbed it with both hands and threw more shots to the body until the referee stepped in and stopped the fight. I was overjoyed and great things ahead. I spoke with Eddie Hearn and we decided I’m going to vacate the title now and we’re ready for the big fish. We’re looking at the Commonwealth or the British, whichever comes first I’m ready for it. I have a great team behind me, they’re doing a great job and the fan base, well what can I say, I have a great fans, you know Eagle, Eagle, Eagle what can I say they’re just great and really support me. They really want to see me fight, not just because I’m a good looking funny guy, they come along and they are loud, which is great as this really pushes me. I’m really happy the way things are progressing, as I keep saying I’m a World Champion in the making, it’s just a matter of time.